Kelly Geary, author of the preserving cookbook Tart and Sweet, was quoted in a recent issue of Organic Gardening saying that she orders a pickle plate whenever a restaurant has it on the menu. 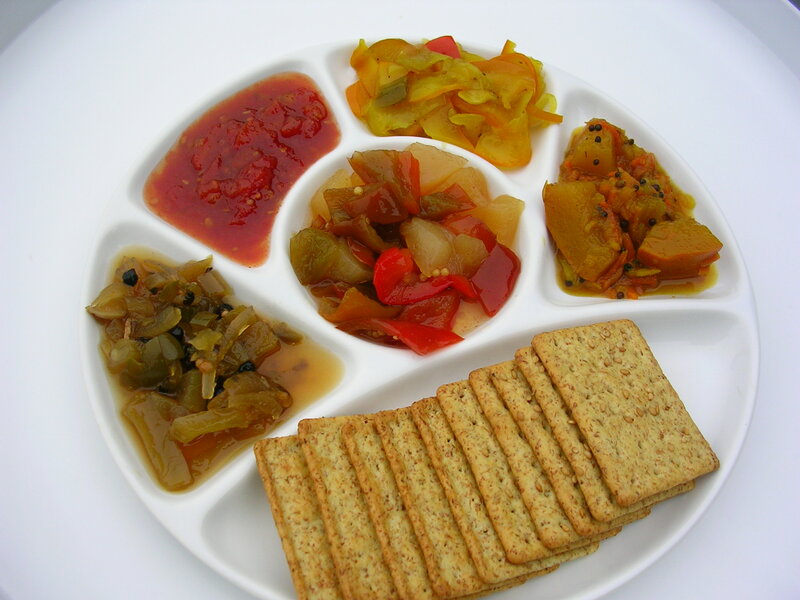 “A pickle plate,” I thought, “what a neat idea. I have canned enough stuff to make one of those at home!” And so I did. My pickle/relish/chutney plate included my Zucchini Relish, Green Tomato Chutney, Golden Zucchini Chutney, and Red Pepper and Apple Relish (photo center; recipe below). Plus, Mark Bittman’s fabulous Tomato Jam, which I have made every year since the recipe appeared in The New York Times in 2008. When tasting the different pickles and relishes all at once (not plain though, we had it with rustic whole-wheat bread, crackers, salami, a couple of hard cheeses, and a glass of chilled Vidal Blanc), I was relieved that I did like all of them. But the greatest surprise, given that I just overcame my green tomato apprehension this summer, was that the Green Tomato Chutney was probably my favorite. Like all the other pickles, the Red Pepper Relish was the result of an overabundance. I had a bumper crop of red peppers this year. In the past I often ended up with jars that contained mostly liquid. Therefore I now drain the cooked solids before filling the jars. Only then do I add as much liquid as is needed to fill the jars, and discard the rest. 1. Cut the bell peppers in half and remove the seeds and dividing membranes. Cut into ½-inch pieces. Peel and quarter the apples and remove the core. Cut into 1-inch cubes. 2. Combine all ingredients in a large heavy pot and slowly bring to a boil. Stir until the sugar is dissolved. Cook uncovered for 25 minutes. 3. Carefully ladle the piping hot relish into a colander placed over a large heatproof bowl. Fill the solids in sterilized jars placed on a damp kitchen towel. Add enough of the hot liquid from the bowl to cover the solids, leaving about ¼ inch headspace. If the liquid has cooled off, quickly reheat it in the pot. 4. Wipe the rim of the jars with a clean damp paper towel. Close jars with brand new lids and bands immediately and process in boiling hot water bath for 15 minutes. 5. Remove from the water onto damp kitchen towels and let sit for 24 hours. Store in a dark and cool place.